Well, Pillsbuy calls it French Bread, anyway. It’s not exactly a baguette, but it is a darn good with a spaghetti dinner when you are camping. We like to use “pie irons” to cook this kind of thing any time we go camping. The trick to using a pie iron is knowing that once metal heats up, it takes a long time to cool down. I call it “coasting.” Heat the pie iron in the fire (full-on flames are fine, or push it under a burning log), but only for several seconds (15-20). Be sure to heat both sides equally. Then for the next two minutes or so, pull it completely out of the fire and let it “coast.” Open the pie iron frequently to check on the status. 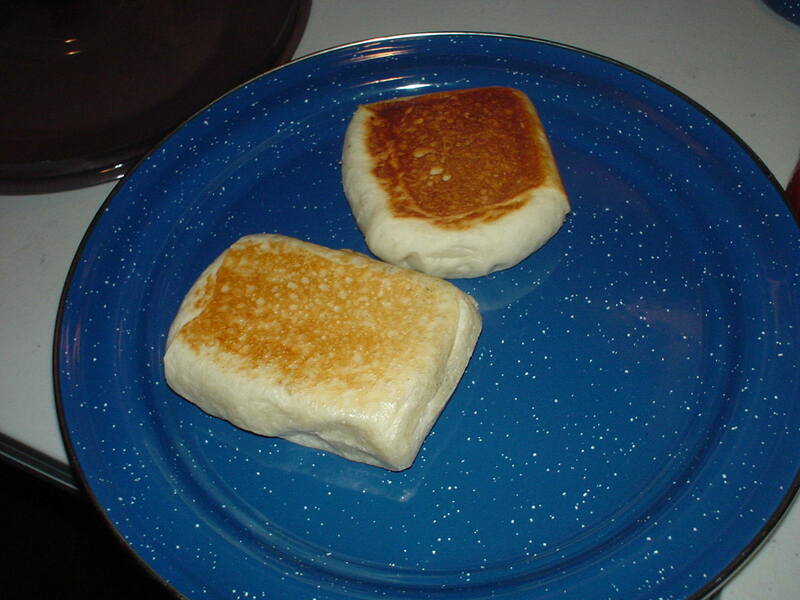 If you are doing it right, you will have a long time between golden brown and burnt. To cook the french bread, we use one can of Pillsbury French Loaf. Cut the loaf into six pieces and spray the iron with a light layer of Pam cooking spray. 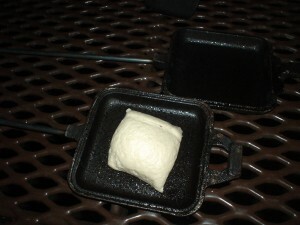 Heat the irons as described above, and soon you will have fresh baked “french bread” as a side dish. By the way, I use aluminum pie irons (shown here) and treat them exactly like cast iron ones. If you don’t scrub away the black inside surface of the iron, it will develop into a beautiful non-stick coating.